Jaki Shelton Green is a writer and poet, a North Carolina native whose publications include Dead on Arrival, Dead on Arrival and New Poems, Masks, Conjure Blues, singing a tree into dance, breath of the song, Blue Opal (a play), and Feeding the Light. 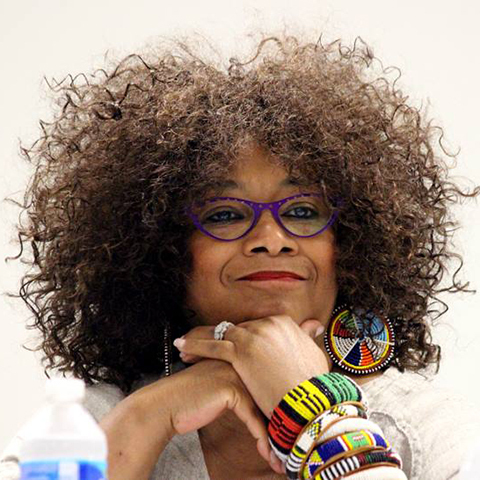 Her work has appeared in publications such as The Crucible, Obsidian, Essence Magazine, Callaloo, and Black Gold: An Anthology of Black Poetry, among many others. In 2014 the North Carolina native was inducted into the state’s Literary Hall of Fame and was nominated for a Pushcart Prize; in 2009 she served as the North Carolina Piedmont Laureate. Among other honors, she was named the 2016 Lenoir-Rhyne University Writer-in-Residence and received a 2007 Sam Ragan Award for Contributions to the Fine Arts of North Carolina and a 2003 North Carolina Award (literature), the state’s highest civilian honor for significant contributions to the state and nation in fine art, literature, public service, and science. Green has taught poetry and facilitated creative writing classes at public libraries, universities and community colleges, public/private schools, and literary organizations. As a creativity coach, Green facilitates workshops and trainings in the United States and abroad, and as a community arts advocate, creates and facilitates programs that serve diverse audiences and populations. Additionally, she judges poetry for schools, anthologies, and prizes such as the Lucille Clifton Poetry Award. Green is the owner of SistaWRITE, which provides retreats and travel excursions for women writers.